What benefits will my family receive if I die in the line of duty? Your family would receive the Federal PSOB Benetit, the State Line-of-Duty Death Benefit, Workers’ Compensation coverage, the NCSFA coverage, and any additional coverage your department might carry. In addition, the NCSFA will pay all educational expenses for the children to any state supported university or community college. What benefits will my family receive if I die of an accident or natural causes and it is not in the line of duty? 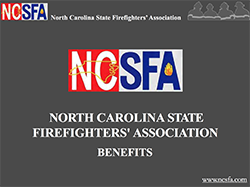 If a member dies accidentally and not in the line of duty, the NCSFA will pay the beneficiaries $25,000.00. No payment is made for death by natural causes unless the member carries fraternal insurance. If I keep retirees on the roster, do they have to get 36 hours of training each year? No, 36 hours of training is not required of those who have retired, but be sure your retirees are not running calls. If they do run calls they must have 36 hours of training annually to be eligible for the state line-of-duty death benefit. 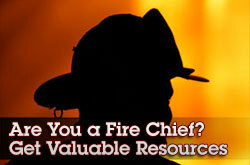 Do I need to keep my retired members on the fire department roster? No, but many departments choose to do so out of respect for the service rendered by the retiree. There are some non-line-of-duty benefits the retiree enjoys if carried on the roster. If enrolled, the retiree is allowed to continue their participation in the FRAP Program, LGFCU membership debit card as well as the $25,000.00 coverage under the Accidental Death and Dismemberment Policy. What is the address of the Association? 8:00 am until 5:00 pm, Monday through Friday. What qualifies as acceptable hours for my 36 hours of training required each year? To get a definition of what qualifies as acceptable training hours we must look at general statute 58-86-25. It simply defines it has “drills and meetings’. Please see the entire statute below for any further clarification or contact the pension office at 877.508.9110. § 58-86-25. Determination and certification of eligible firefighters. What does the word “certified” mean on the roster? The roster for NCSFA serves two purposes. The first is to provide current information of who is on your roster, but it also serves as the certification roster for the State Treasurer’s Office. 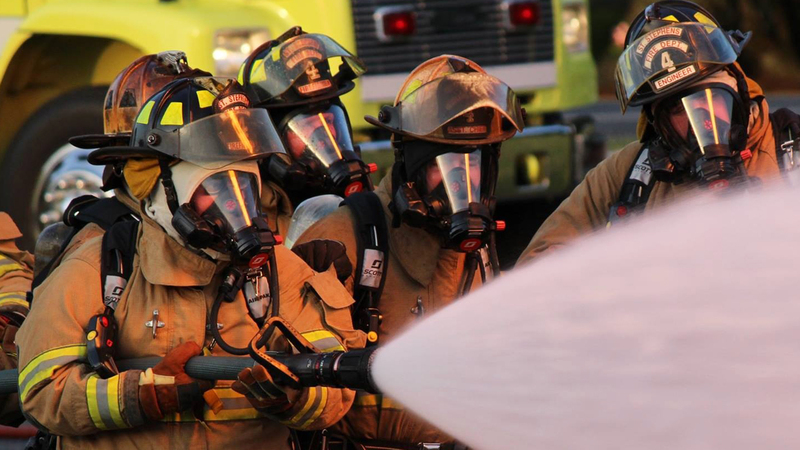 The term “certification” simply means that the chief is ‘certifying’ that their members have received their 36 hours of training as required to receive pension benefits and to receive the state line-of-duty death benefits. To get a definition of what qualifies as acceptable training hours we must look at general statute 58-86-25. It simply defines it as “drills and meetings’. Please see the entire statute below for any further clarification or contact the pension office at 877.508.9110. § 58‑86‑25. “Eligible firemen” defined; determination and certification of volunteers meeting qualifications. How do I leave one department and go to another? The department you are leaving would remove you from their roster. The department you are joining would add you to their roster. These processes are done online by the Fire Chief with password protected logins for each department. If I’m a member of more than one department, do I have to be on both rosters and pay dues at both departments? You must be on the roster for all departments on which you run calls. If you are not on the roster of the department you are on duty with and get injured or killed in the line of duty then you may not be eligible for some of the death benefits. Can administrative staff and ladies auxillary be on the roster? No. 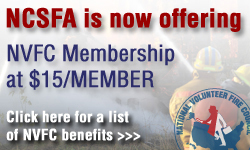 Only firefighters can receive member benefits and pension benefits. How can I find out how many years of service I have in the pension? Please contact the pension office directly at 877-508-9110. Can I buy back years of service in the pension? Yes, you can buy back years. 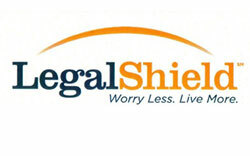 You must contact the pension office to get the information on this at 877-508-9110. What can I use my local relief fund money for? Please see General Statute 58-84-34 below with explanations in red. Contact Ed Brinson if you have any further questions regarding use of your department’s relief fund monies. § 58-84-35. Disbursement of funds by trustees. (3) Repealed by Session Laws 1985, c. 666, s. 61. Am I eligible to get help from my department’s relief fund money? You must present your request to your department’s local relief fund board and they must send a written request to our office in order for an approval process to be considered. How long does a member have to be on the department before the Relief Fund board can give them money? There is no service time requirement. Unless the situation is Line of Duty related, a written request must be submitted to NCSFA for approval. See below for further explanation from General Statute 58-84-35. (7) To provide for annual physicals that are required for firefighter positions by the Department of Labor or are recommended by the National Fire Protection Association. (8) To cover necessary management and investment costs that are reasonable and appropriate in relation to the assets, purpose, and financial security of the local Firefighters’ Relief Fund. 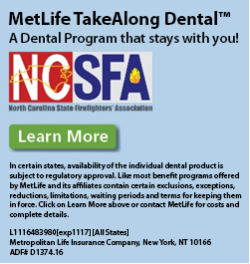 (b) Notwithstanding any other provisions of law, no expenditures shall be made pursuant to subdivision (5), (6), or (7) of subsection (a) of this section unless the North Carolina State Firefighters’ Association has certified that such expenditures will not render the Fund financially unsound for the purposes of providing the benefits set forth in subdivisions (1), (2), and (4) of subsection (a) of this section. If, for any reason, funds made available for subdivision (5), (6), or (7) shall be insufficient to pay in full any benefits, the benefits pursuant to subdivisions (5) and (6) shall be reduced pro rata for as long as the amount of insufficient funds exists, after first eliminating the benefits pursuant to subdivision (7). No claim shall accrue with respect to any amount by which a benefit under subdivisions (5) and (6) shall have been reduced. (1) Five hundred dollars ($500.00) multiplied by the number of eligible firefighters in the local department. (2) Twenty thousand dollars ($20,000). How do I update our Roster on-line? Please go to the roster management portion of our website for instructions. Am I eligible to apply for scholarships? If you are a member in good standing of a department that is a member of the NC State Firefighters’ Association then you are eligible to apply for the regional scholarships. Scholarship applications are accepted annually from January 1st to March 15th. Is my child eligible to apply for scholarships? 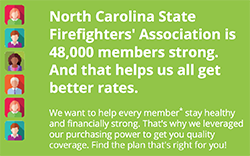 If you are a member in good standing of a department that is a member of the NC State Firefighters’ Association then you are eligible to apply for any of the applicable scholarships to help further your child’s education. Can my hours of service transfer from one state to another? More details available at the Office of the State Fire Marshal website on this subject. Don’t see your issue addressed?